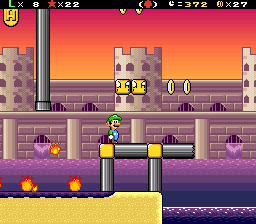 Super Luigi Land - Sugar Ruins - 12 more levels to go! 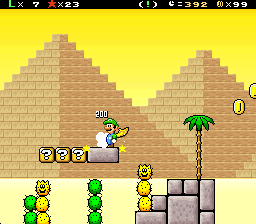 Forum Index - SMW Hacking - Works in Progress - Super Luigi Land - Sugar Ruins - 12 more levels to go! Master Engineer, at your service. Very good work as always, Gamma V; however, let's see the third image. 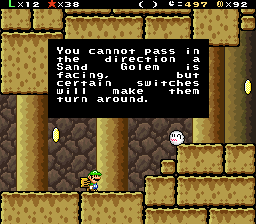 You see, even if you haven't activated the green switch yet, it is possible to cross the gap by jumping while ducking; you can do this even without a cape. 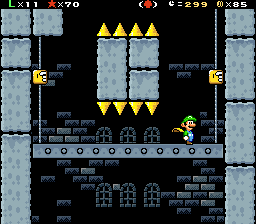 Maybe stretching the gap to 3 switch blocks at least is a good solution (if you desire so). Signed Major Flare, a.k.a Br OW Hacker. 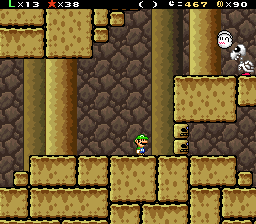 After much procrastination, the final level of Cola Cavern is complete! 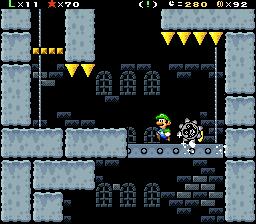 The castle is actually outside of the cavern, so you can finally see those sweet HDMA gradients again. 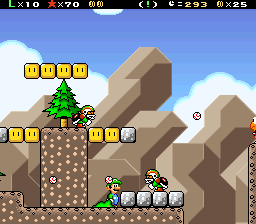 Koopas with black shells are Bombshell Koopas, and the gray blocks can be destroyed by ANY explosion. 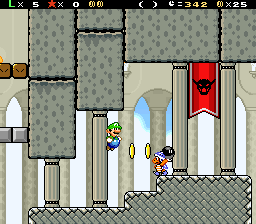 The second room introduces Bullet Bill Blasters. 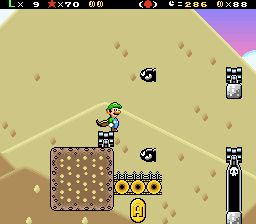 Bowser throws Bob-Ombs, attempting to destroy the ground you stand on. 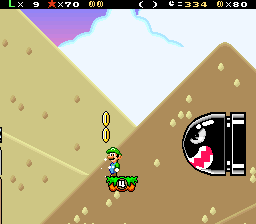 You have to throw the Bob-Ombs back at him, but they don't have to explode. They just have to hit him. "Experience, lad. You should learn to appreciate it." 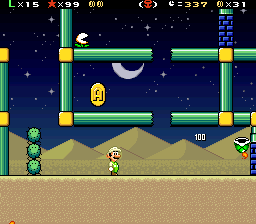 It's pretty much a generic introductory desert level, and that means plenty of Pokeys. Sumo Bros. too? Why not? They use the same sprite graphics set. Good thing I have a Yoshi. Oh yeah! A desert world! Now we're talkin'! Keep up the good work, Gamma. Looks solid, especially last pic. Keep it up! I can build levels, test your hacks, and sometimes fulfil ASM requests. What does that mean? 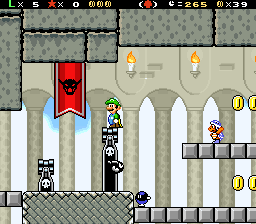 It means this level is somewhat inspired by the fourth and seventh castles of SMB1. These are the Stone Gates the sign was talking about. Once you cross one, you'll either be warped to the other side or sent back, depending on if you're taking the right path. 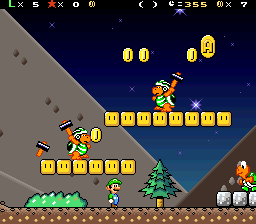 A-Coins can hint at which path is correct. Don't stare at the Nipper too long. He spits fire! Bits of this may be silent because of music copyright shenanigans. 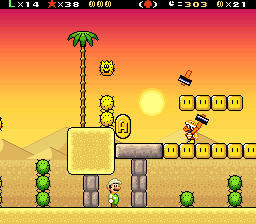 As the obligatory haunted level of Sesame Sands, this pyramid has its own puzzle/gimmick, which is explained here. 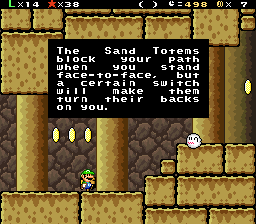 These are the "Sand Golems." You can only get past them when their backs are turned, but how do you make them turn their backs? You do it with an ON/OFF Switch. Looks like you'll need a P-Switch to get to this one. 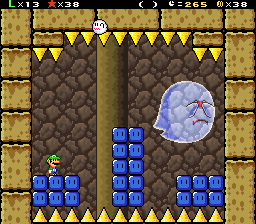 This level ends with a Big Boo fight. 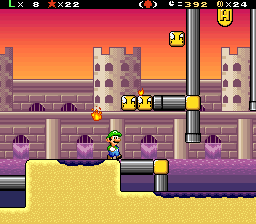 After showing off this level in Discord, I was advised to change the graphics used for the "Sand Golems," better known as ON/OFF One-Way Blocks. 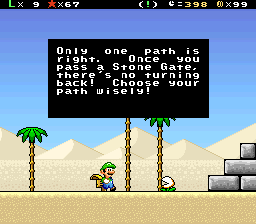 After doing that, I decided to rewrite the opening message that explains the level's gimmick. 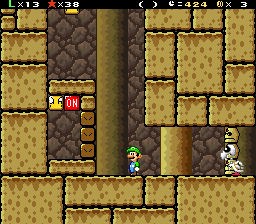 There's no Twitch VOD for the creation of this level. I did try to stream it, but my mother kept calling me away, so I just gave up on that. Does anyone even watch those streams? 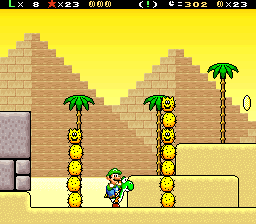 Nice Desert levels you have here! Thanks, MKDSMaster! Are you ready for another one? 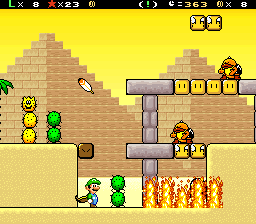 This level is littered with stationary Pokeys whose heads bounce, a gimmick based on the level Pokey Oasis from Mecha-Bowser's Revenge. 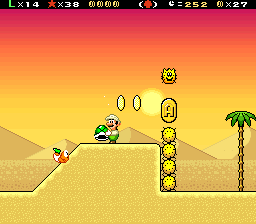 The Pokey heads are tweaks of the football sprite, whose RNG has been replaced with a more consistent low, medium, high bounce pattern thanks to Mandew. Hammer Bros? 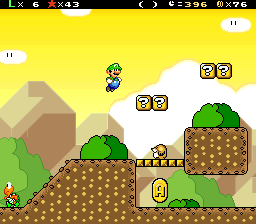 Well, this is World 5! Best to go around back to get this A-Coin. Getting rid of the Hammer Bro won't hurt either. 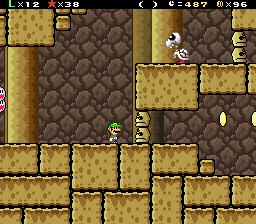 You need a shell to get this last A-Coin. 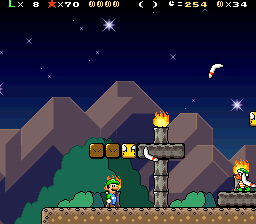 Originally, I planned to make a Starman available for this, but, for some reason, the music/sound breaks after the star power wears off, and the game would freeze during transitions to sublevels/the Overworld. 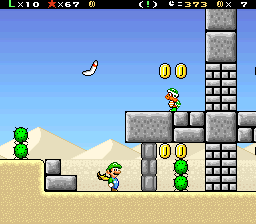 It also would've let you rack up a TON of extra lives. Sorry to keep you waiting. I lost motivation for a bit because of more criticism about how similar all my hacks are. Either way, here's the next level. Looks pretty standard so far, but this is just the beginning. 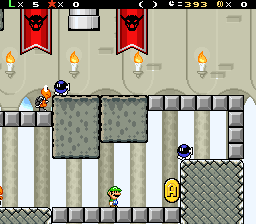 This level is inspired by level 7-9 from SMB3. Wonder how I'm gonna get that one? 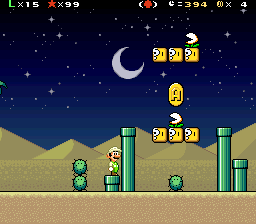 I'm having a glitch involving the reskinned Throw Blocks. 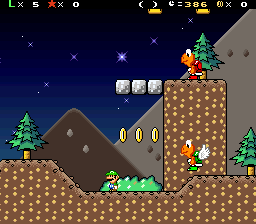 Sometimes, they act like Yoshi Coins when another Throw Block hits them. 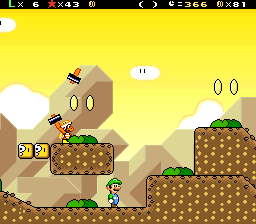 They also seem to cause blocks above them to act like Yoshi Coins. 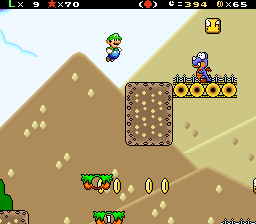 I'm wondering if it's a side-effect of the Kicked-Object-Collectible Coins/Yoshi Coins patch I have installed. 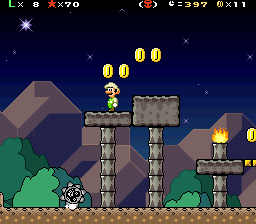 The level looks pretty nice so far. 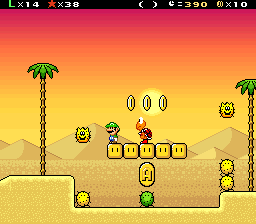 If you have some extra time you could generate and insert a code to enable parallax scroll to allow pyramids to move and let the sky static, that might cause a conflict with the gradient you already have though. About the glitch you mention; since that patch modifies routines relevant to coin collection, it is a possible cause of the problem. I hope you can solve it, maybe you'll just have to go back to an early unpatched backup and extract/insert some recent levels you made. 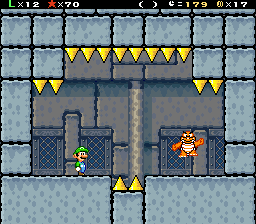 Either way, the bug doesn't seem to happen with the vanilla Throw Block, only with tiles set to act like it. It's a sort of oil field level. 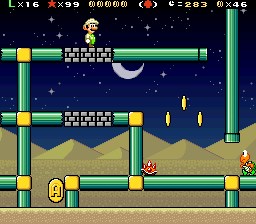 The puddles of oil are slippery, and you don't want to be on them when a Hopping Flame lands. Otherwise, they'll leave behind permanent flames. 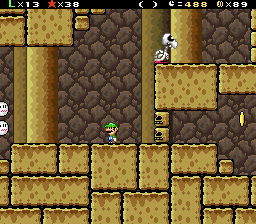 This part took a lot of debugging from imamelia to get working right. Better grab that coin quick! 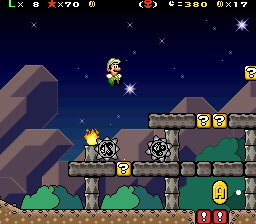 Mandew's Venus Flyin' Trap also appears here as a bit of an homage to the Octas enemy from Oil Ocean Zone, which sort of inspired this level. It's time for a HUGE bump on this thread. 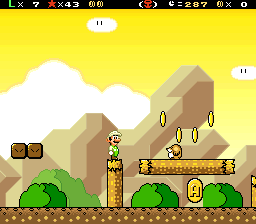 With C3 all said and done and my 5-World demo now accepted, I figured it was time to get back to work on this hack. Rexes? This can't be too hard. 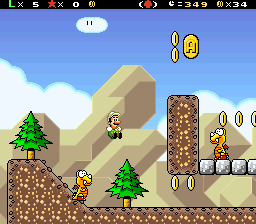 Yeah, THOSE Rexes are easy, but these yellow ones chase you while moving about as fast as a Monty Mole. You also have to worry about Rexes sliding down steep slopes. The hack came back! 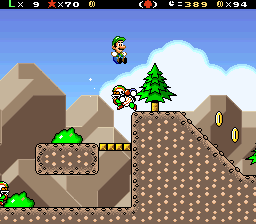 Also, I just love that Cocoa Cliffs thing! I already love this hack (since it's a choconilla hack). 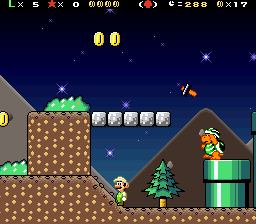 It reminds me of Bowser's Catastrophic Trouble (I think that's what it stood for), which is my favorite of your hacks, Gamma V. I can't wait to see more progress and wait to see the final release. I've made a lot of progress since my last post, but I didn't want to quadruple-post. It's all about Moles and Hammer Bros. The main enemy here is Tsutarja's Grrrol sprite, relased during this last C3. Let the good times Grrrol! 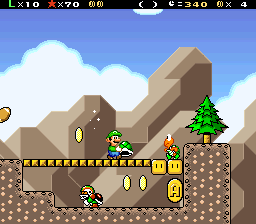 Here's a good opportunity to take advantage of the fact that shells can collect coins. 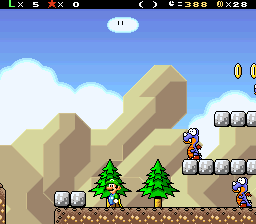 Boomerang Bros. are here too. 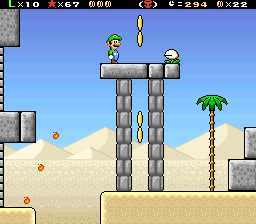 This is the first level that began life as an SMW Maker level. 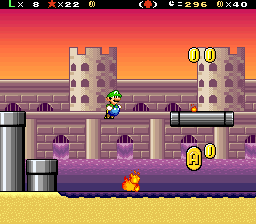 This level was called Bullet Time, and here's why. This is a tricky obstacle. If you're not powered up, you won't be taking out the Puntin' Chuck. If you didn't hate sports before this, you'll hate them afterwards! 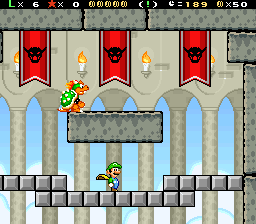 The Grrrol sprite, and the World 5 Tower in New Super Mario Bros. DS, inspired this fortress, but it could've easily been a totally different level if Knight of Time didn't help out. There's no Layer 2 Rise command that works with a vertical level. 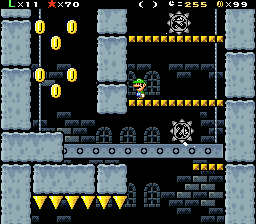 I initially tried getting Erik's Layer 2 Rise/Sink UberASM code to work with a vertical level with help from both imamelia and Erik himself. Neither could figure out how to make it work. I waited for several days for them to get back to me on that. 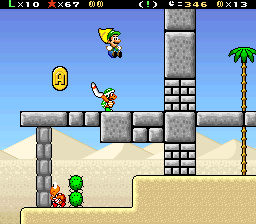 In the meantime, I eventually learned from Knight of Time that I could get the desired effect with the Vertical Auto-Scroll generator and a Layer 2 scroll setting of H = Constant, V = None. It's not perfect though. Calling your reserve item on the elevator will cause you to fall though. This is where the Grrrols come in. There was an A-Coin here, but I already collected it. 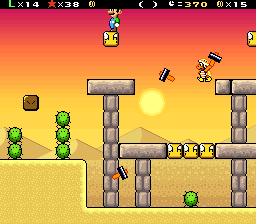 The spikes make this Boom-Boom fight tougher than you'd think. 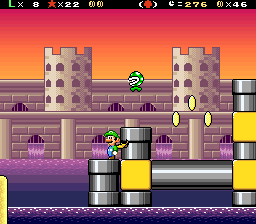 Oh hey, you managed to get the gimmick to work for the world 5 fortress. Awesome! 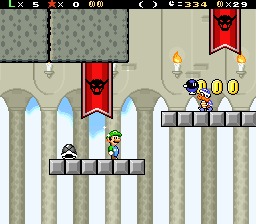 As for the fortress, the level is pretty interesting and definitely reminds me of the gimmick from New Super Mario Bros DS. 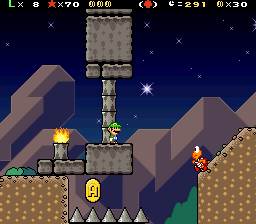 As for the other levels, their pretty good although COCOA RUINS seems a little too short for world 5 in my opinion. Nothing interesting to add here. 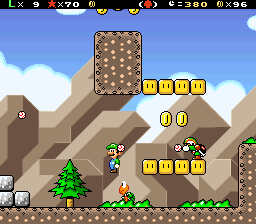 How many worlds and levels are in this game? 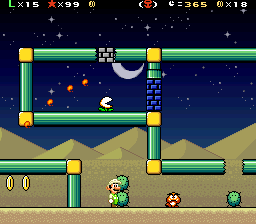 @Fullcannon: It'll have 93 levels across 8 worlds. 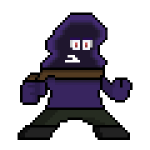 The giant enemies from Walnut Woods 6 are back. Since all the enemies are big, Hammer Bros are replaced with Sledge Bros. There was a Sledge Bro on the high road, as well as an A-Coin on the low road. I collected the coin and killed the enemy before taking this screen.